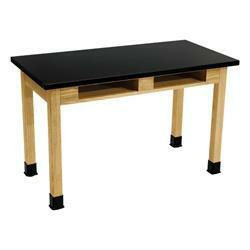 Science and lab tables serve a highly specific function that requires specialized construction and materials. Here at A&M Church and School Furniture, our products meet the standards of science classrooms and laboratories everywhere. Coming from some of the top school and church furniture manufacturers in California and the US like Allied and National Public Seating, our science and lab tables are built for strength, safety, and efficiency. The legs are reinforced with the use of heavy duty steel, or wood with metal-on-metal double bolt. Table tops and aprons are finished with chemical-resistant and water-resistant laminate. Our products come in various sizes to meet your individual needs while ensuring plenty of room for your lab and science equipment and materials. The height conforms to industry standards, promoting safety and convenience. Some of our models feature one or more book compartments for added functionality. 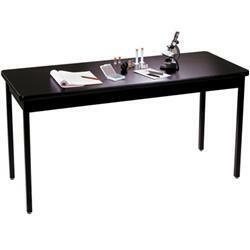 Shop your science and lab table requirements here on our website and find excellent affordable options.